IT (Information Technology) Social Science, Sociology, Ethics, etc. Experience Years of translation experience: 17. Registered at ProZ.com: Jun 2003. Became a member: Oct 2003. Professional practices Robert Forstag endorses ProZ.com's Professional Guidelines (v1.0). My professional background is in Psychology and Social Work and I am also widely read in a variety of areas, including social sciences, history, and law. I have professional translation experience in the legal, business and medical fields and previously served as the editor of an internationally distributed ophthalmology magazine. I have a particular interest in, and flair for, marketing copy. 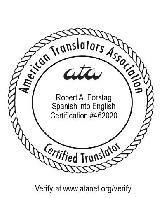 In my own view, the *sine qua non* of any effective translator is a complete mastery of his or her native tongue. I have to offer any potential client or colleague both this essential skill as well as a solid foundation in the Spanish language, which I have studied and worked with intensively for many years. I will work hard to precisely and elegantly translate any text that is placed in my trust. I am currently working as a freelancer, as well as an editor of texts in the English language, and I would welcome the opportunity to collaborate on projects, large or small, within the subject areas that I am familiar with. I offer professional work for professional compensation. Please contact me personally regarding any project which falls within my range of expertise if the rates you pay match the rates that I accept, as stated on my profile page. Please do not include me in any general lists that are used for mass mailings in order to attract the lowest bidder from among dozens of respondents. I do not answer such mails, for I feel that they downgrade the profession of translation. For the same reason, I do not typically "bid" on posted jobs on this or any other website.